"Don't You Care" by The Buckinghams holds at the #1 Spot for the third week in a row on the WLS Chart (now dubbed "The Super Summer Survey")!!! Meanwhile, over at Super 'CFL, Tommy James and the Shondells leap from #7 into the #1 Position with their latest, "Mirage". 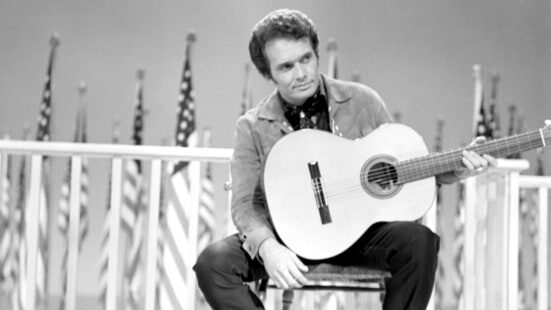 Future Country Music Legend and Superstar Merle Haggard makes his first appearance at The Grand Ole Opry in Nashville, Tennessee. In late 1966, the members of the first lineup of the Grass Roots defected to form a different band. In response, Dunhill records recruited another band, the Thirteenth Floor, the members of which agreed to become the Grass Roots. The new complement consisted of lead guitarist Creed Bratton, rhythm guitarist-keyboard player Warren Entner, drummer Rick Coonce, and bassist Rob Grill -- whose singing voice mesmerized Dunhill owner Lou Adler and the label's writing and production team of Steve Barri and P.F. Sloan. "When we heard Rob's voice, we felt he really had the sound that we were looking for as a vehicle for our song writing," Barri told authors Marti Smiley Childs and Jeff March for their book "Where Have All the Pop Stars Gone? Volume 2." But the first substantial hit for the recomposed Grass Roots came from another writing team. In early 1967 Sloan and Barri got wind of "Piangi Con Me" (Cry With Me), a pop hit in Italy performed in Italian by an English group called the Rokes. The song, written by David Shapiro, Ivan Mogull, and Michael Julian, was translated to "Let's Live for Today" in English. The Grass Roots version, which Sloan and Barri produced for the Dunhill label, premiered on May 13, 1967, soared up the pop chart, peaked at No. 8 on the Hot 100, and remained on the chart for 12 weeks. By the spring of 1967, the Moody Blues recognized that their blues repertoire had run its course, and decided to develop their own style. The band members conceived a new approach: a stage show -- a musical about the passage of a single day. "At the time, we could not get money for enough studio time. We used to get three hours to do the A and the B side, and everything had to be three minutes or less, with a catchy hook, which was crap," the band's flutist Ray Thomas told authors Marti Smiley Childs and Jeff March for their book "Where Have All the Pop Stars Gone? Volume 2." On their own, the Moody Blues began writing songs for the musical, and the band's keyboard player, Mike Pinder, obtained a Mellotron instrument to orchestrate the musical on stage. On BBC's "Saturday Club" program that aired on May 13, 1967, the band premiered one of those songs that Justin Hayward had written. It was "Nights in White Satin." Mike Pinder recalls, "As we started writing more, we knew there was something to it. Once we had 'Tuesday Afternoon' and 'Nights in White Satin' we thought 'oh -- we need something for the morning, something for the evening, dawn, and sunset,' and that's how the whole thing came about." He was referring, of course, to the band's milestone concept album "Days of Future Passed." Lots of "Friends Of Forgotten Hits" on the chart this week … "Yellow Balloon" by The Yellow Balloon sits at #35, "Get Me To The World On Time" by The Electric Prunes falls to #45, "Alfie" climbs from #66 to #57 for Dionne Warwick, "Can't Seem To Make You Mine" by The Seeds is up nine places from #69 to #60, "It's All Over Now" by The Casinos climbs from #75 to #66, "Come On Down To My Boat" by Every Mother's Son leaps fifteen places from #90 to #75, "Blues' Theme" by Davie Allan and the Arrows sits at #89 and "Ding Dong The Witch Is Dead" by The Fifth Estate premiers at #99. That doesn't even take into consideration previously mentioned tunes like "Groovin"" by The Young Rascals, "Don't You Care" by The Buckinghams, "A Little Bit Me, A Little Bit You" by The Monkees, "I Think We're Alone Now" and "Mirage" by Tommy James and the Shondells, "Happy Together" by The Turtles, "Him Or Me - What's It Gonna Be" by Paul Revere and the Raiders and "Girls In Love" by Gary Lewis and the Playboys, all enjoying chart success this week. Andy Williams' vocal version of "Music To Watch Girls By" falls from #39 to #70 while personal favorites like "My Girl Josephine" by Jerry Jaye, "Do It Again A Little Bit Slower" by Jon and Robin and "Here We Go Again" by Ray Charles continue to move upwards on the chart. Archie Bell is drafted into the US Army. A year later, when his record "Tighten Up" goes to #1, a series of "fake" Archie Bell and the Drells groups crop up all over the country, trying to cash in as the hot band while the REAL Archie Bell is stuck in Viet Nam and unable to do anything about it! The Beatles record "All Together Now" for the "Yellow Submarine" movie soundtrack. I asked Alex Valdez of The Yellow Balloon, a Forgotten Hits Reader for YEARS now, to fill us in on the history of The Yellow Balloon. I wondered if the group existed first and then Don Grady came on board or if he recruited them to be "his" band ... or if they all went thru some type of auditioning process for Grady ... or just how it all came together. And finally, what was it like at the time touring behind a hit record. (We recently ran a YouTube clip of The Yellow Balloon performing at Anaheim Stadium after an Angels game.) Did they tour with any other big names during this time? "Yellow Balloon" peaked at #25 nationally on the Billboard chart ... and was a #12 hit here in Chicago on WCFL. Well, I'll give it a shot here. As it was told to me, the Yellow Balloon kind of existed before we came on board, but without Don Grady. It consisted of players from around the Hollywood area that were already known to some degree. I believe some were from "The Leaves", I'm not sure. I know that Mark Andes (Heart, Firefall) was in the group and maybe Darryl Dragon (the Captain), I think I heard mentioned once. As I further recall what was told to me, this ensemble was making contractual demands that the label didn't want to give in to, so they all parted company. Don Grady was on the label with his "Windup Watch Band", and was enjoying a moderate success with his "Children of St. Monica" record. Months prior to our becoming balloons, Grady had us over for an audition in Hollywood, for a new band he was forming. We came at the suggestion of a local Tucson disc jockey named T Michael Jordan, who befriended Grady when his group played Tucson. After the audition, we went back to Tucson somewhat dejected and out of work since two of our players were taken by Viet Nam. When the first concocted band of Balloons were discharged, the project was given to Grady to take over. The song was starting to take wings and a band was needed for promotions sake. Three members of my "Five of Us" band (Sundazed Records), auditioned for Grady and apparently left an impression on him. It was two months later that we got the call with the offer to play in the group. Paul, and myself were invited, but not our bass player George (the best showman in the group). I guess Grady had already picked his keyboard and bass player from up in the Oregon area. The "Yellow Balloon" song had been meant for Jan and Dean when it was written by Gary Zekely. I guess Gary was unhappy with the way the Jan and Dean recording turned out and decided to knock on doors for another deal. I personally was never crazy about the song, but hey, what did I know at age 20. Gary landed at Canterbury records where the owner, Ken Handler, heard the same potential that Gary heard, and they immediately hired professional voices and players to make the record. They had to act fast so as to beat out the release of the Jan and Dean version. If I had heard both versions back then, back to back, I can't say for certain which one I would of have picked. Our version seemed catchier, but not necessarily better. I really liked Jan and Dean back then ... their music would allow escapism as a resident of the desert. That being said, I guess the reason for the reverse of the song for a "B" side was due to frugality on behalf of Canterbury ... they simply didn't want to pay the session people to do another one of Gary's many songs. Gary could go to the restroom and come out with a song. I imagine maybe a few hundred records were pressed, I really have no idea, but I was told that it wasn't many, I don't know. One night, shortly after joining the band, Ken and I went to Sound Recorders Studio where only Armin Steiner, Ken and myself were present. That is when I put down the lead vocal for Yellow Balloon, and the original was removed. We were compiling and training for the album and Ken wanted no claims by the original singer on the album, especially the titular song. With the exception of some background vocals on the "Yellow Balloon" song, all of the voices on the album are by the band, and Gary Zekely. As for Don Grady in disguise with the name of Luke R Yoo, that was a promo stunt devised by the management as a means to further promote Grady. His personal manager became the Balloon's personal manager. The disguise was really goofy and I never liked it. I wanted people to know it was Don Grady, as it would've been good promo for the group. The manager, who I won't call by name (I really grew to dislike the SOB) albeit, he was connected. The money situation got funny, as is in most cases with managers, so eventually we lost momentum and the desire to continue. When we got to tour, Grady had to work on "My Three Sons" and he couldn't make the tours, so the label said we should hire a drummer. I piped in, "No need ... I can play drums and sing lead and we don't have to slice the pie anymore." So after we were heard by management as a four piece, it was determined we could very well do it. I missed Grady's voice though because he was strong vocally. Anyway, we persevered and got fairly tight in the process. Our time in Chicago was the result of having a midwest tour with many dates. Never having been to the midwest, it was like a whole new world. I liked it, big buildings and different music, with different players. My first big deal for the Balloon was playing the Teenage Fair on Navy Pier. Our date had Neil Diamond, Bobby Goldsboro, and this killer group called The Exceptions. What an event. Our song was climbing fairly rapidly and we were constantly on the move. I can't remember who all we played dates with, because my memory is fading, but I do know the New Colony 6 and The Cryan' Shames for sure. Having Don Grady in the group opened doors that would have never opened otherwise. We got special treatment on American Bandstand and Shebang with Casey Kasem, this because they knew Grady all along. I could probably conjure up more tidbits , but I'm sure people could dig up more from the other sites about our group. As for after the Balloon, I played with a couple of other groups as the lone guitar / lead singer, once with some heavyweight horns with charts doing Tower of Power type stuff. Then with a group of players where I was the only white dude. We had four horns doing Earth, Wind and Fire, Commodores, other stuff from the late 70's. Then I finally joined my father's export import business and became an honest businessman. Somehow I ended up procuring all required licensing for international arms sales. Traveling to Bogota during the heyday of Pablo Escobar and working with their military was iffy, also Central America and aiding the Contras etc etc. Sinaloa state police were big clients. There's much more but it becomes too much . I don't like to wax about it anymore. Oh, I have written some songs finally and will look for publishing outlets soon. I'm not bulling when I say they are good. I'm on the keyboard. I've thrown away a lot of songs over the years, but these, no way. I think God is throwing me a bone. 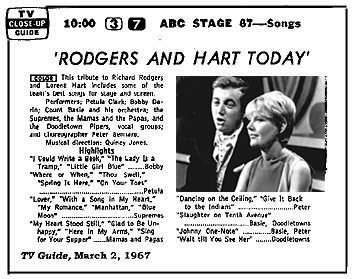 ABC-Television presents "Stage 67", a salute to "Rodgers and Hart Today", featuring performances by The Mamas and the Papas, Petula Clark, Bobby Darin and The Supremes. 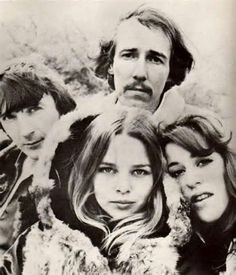 The Mamas and the Papas go on to score a Top 20 Hit with the Rodgers and Hart tune "Glad To Be Unhappy" later that year. 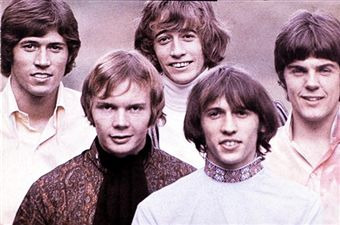 After a string of hit singles, the group disbands in late 1969 / early 1970. However, this was hardy the last we'd hear of the group. A series of lush ballads followed … and then in 1975, they completely reinvented themselves by adopting an R&B Sound that soon segued into disco, the hot new craze. 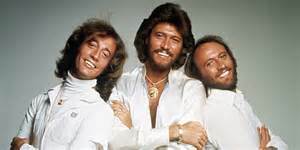 In fact The Bee Gees virtually became the poster children for The Disco Era, writing the soundtrack to the popular film "Saturday Night Fever". They would score EIGHT more #1 Records between 1975 and 1979 with hits like "Stayin' Alive", "Night Fever", "How Deep Is Your Love", "You Should Be Dancing", "Jive Talkin'", "Tragedy" and "Too Much Heaven." 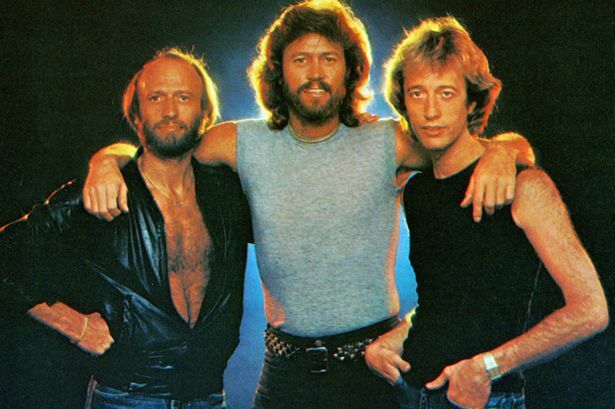 Big brother Barry (Bee Gees = The Brothers Gibb) would write and produce many more #1 Hits for several other artists, including baby brother Andy Gibb, who chose to pursue a solo career rather than join his brothers as part of The Bee Gees. By 2012, only Barry survived … baby brother Andy died in 1988, as did twins Maurice in 2003 and Robin in 2012. Paul Petersen (formerly of "The Donna Reed Show") signs with Motown Records. (WHAT?!?!? Isn't Motown supposed to be SOUL label?!?!? Is there ANY guy whiter than Paul Petersen?!?!?) 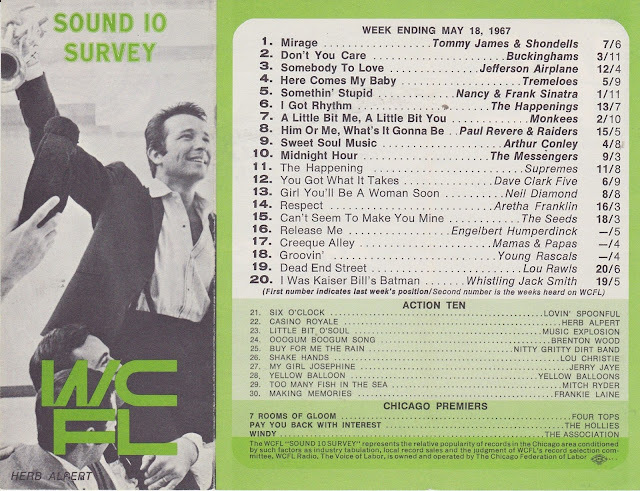 Paul hit the charts twice in 1962 with The Top 20 Hits "She Can't Find Her Keys" (#19) and "My Dad" (#6). His on-screen sister, Shelley Fabares, went all the way to #1 with her first chart hit, "Johnny Angel" that same year. The Jimi Hendrix Experience perform at the Theatre d'Issy Les Moulineaux in Paris, France. 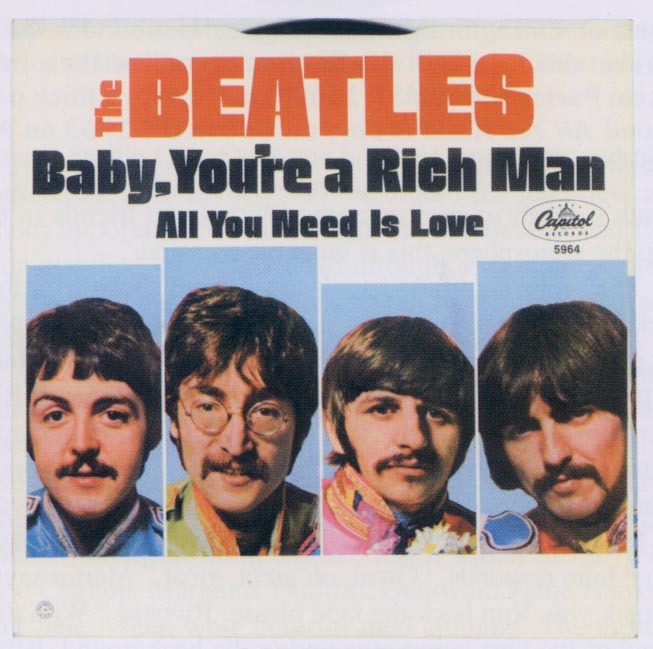 The Beatles record "Baby You're A Rich Man". The song was first targeted for use in the new animated film "Yellow Submarine." (The Beatles committed to recording at least three new tracks for the movie.) Although "Baby You're A Rich Man" was ultimately used in the film, it was first released as the B-Side of their #1 Summer Single "All You Need Is Love".